I admit it. I’m a bit of a hoarder when it comes to cardboard tubes. I just can’t bring myself to part with them. 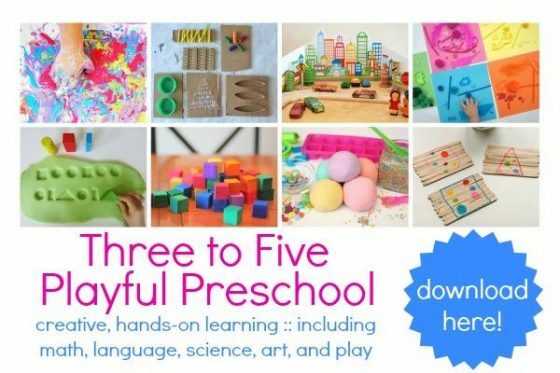 Here in my daycare, we love crafting with toilet paper rolls, paper towel rolls, wrapping paper tubes, food-wrap rolls, poster tubes, mailing tubes… My family thinks I’m nuts, but when you think of all the things you can make with a cardboard tube, how COULD you possibly throw them away? 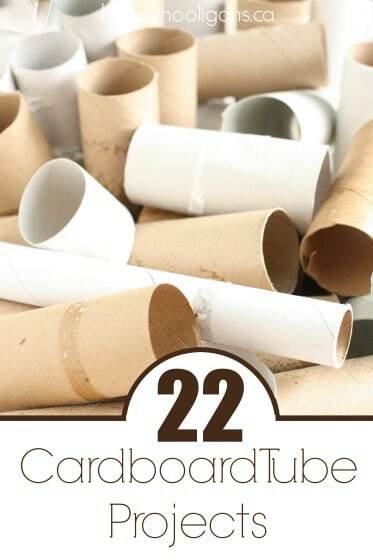 There are hundreds of ways to re-use your cardboard tubes. 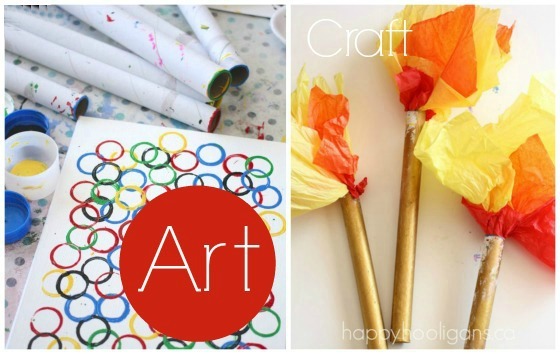 Toilet paper tubes and paper towel rolls are perfect for most preschool crafts. Wrapping paper rolls are great when you need a super-long tube, and the tubes that hold cling-wrap or aluminum foil are great when you need something a little sturdier. Do you have a growing stash of cardboard rolls at your house? 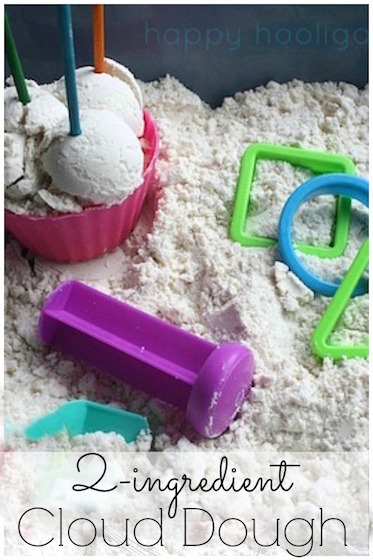 Well, bust ‘em out because I’ve rounded up 22 ways for you to use them in the craft room and the playroom. 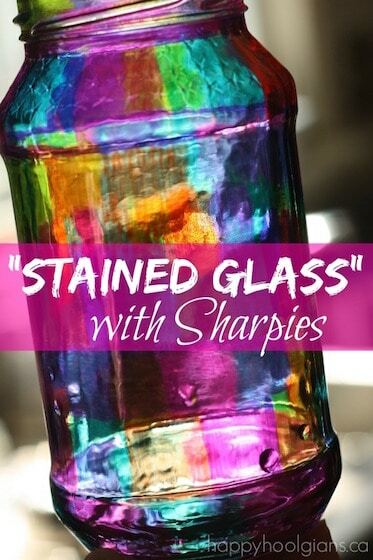 Click on the highlighted descriptions to see a full tutorial for each craft or activity. 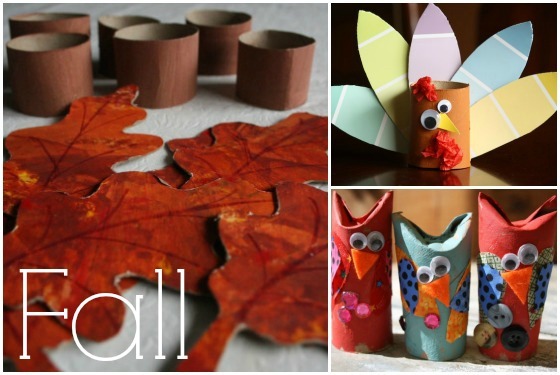 Use a cool paint process to make some fall napkin rings. Make a turkey table topper for your Thanksgiving table. 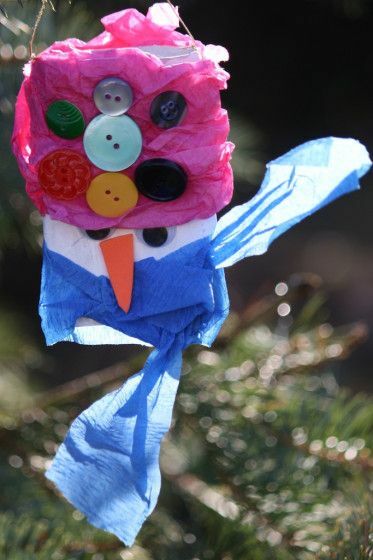 Round up some fabric scraps and a few crafty odds and ends for some adorable toilet roll owls. 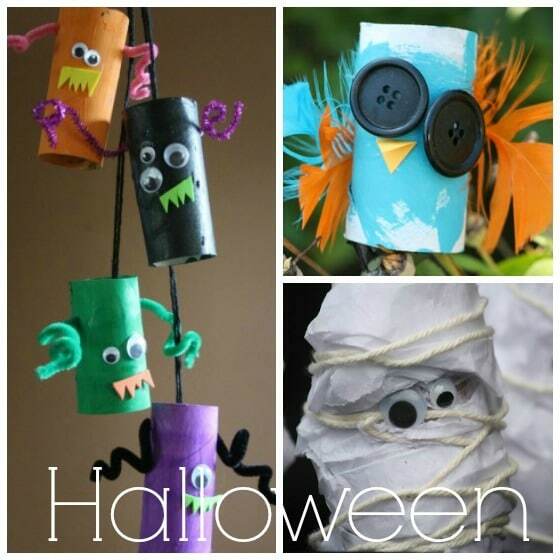 The kids will love making a quirky monster mobile out of cardboard rolls. A spooky crow or owl is a very fitting decoration for Halloween. Our toilet roll mummies help little ones develop their winding and wrapping skills. 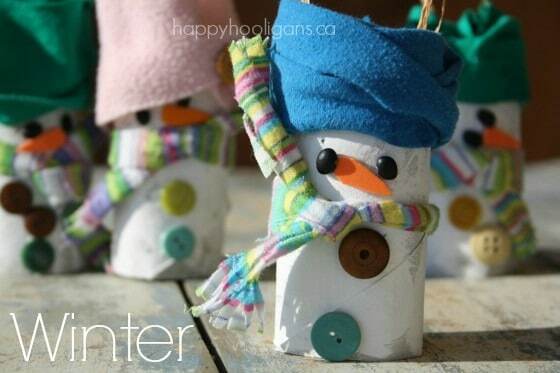 These cardboard roll snowmen are just the cutest little things, aren’t they? The hooligans LOVE playing with our toilet roll Nativity set. Fleece, batting and a cardboard roll makes an adorable Santa Claus. 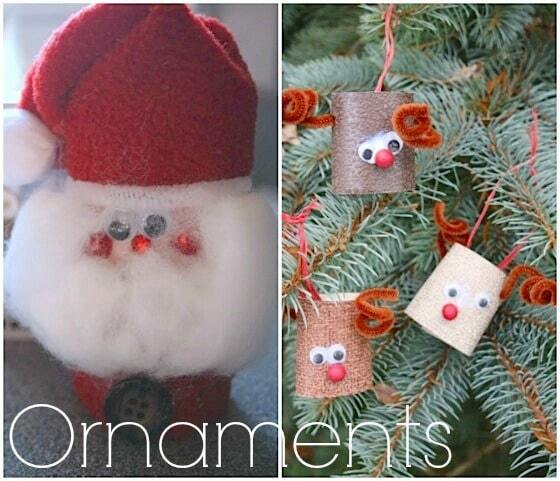 Make a set of cute reindeer ornaments for your Christmas tree. This snowman ornament would be great for the tree or as a gift topper. Summons up some April showers with a colourful rain stick. 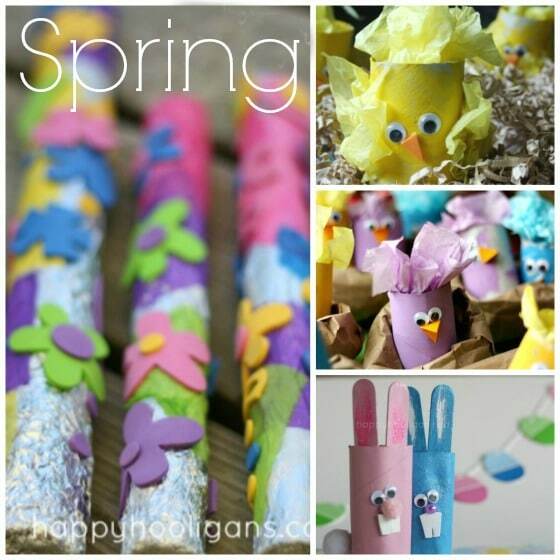 These Easter chicks in paper nests are just too sweet. Peeps! Everyone loves Easter peeps, right? And don’t forget about the Easter bunnies! Check out our paint chip bunting too! 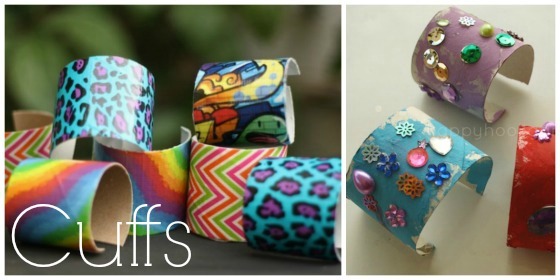 Make some simple toilet roll cuff bracelets. Anklets can be made using cardboard rolls and colourful duct tape. Make some cool 3-D structures with tubes and a low-temp glue gun. Toddlers love to drop things through our cardboard Drop Zone. Create a unique piece of art for a kid’s room, toy room or classroom. Turn a long cardboard tube into a torch. 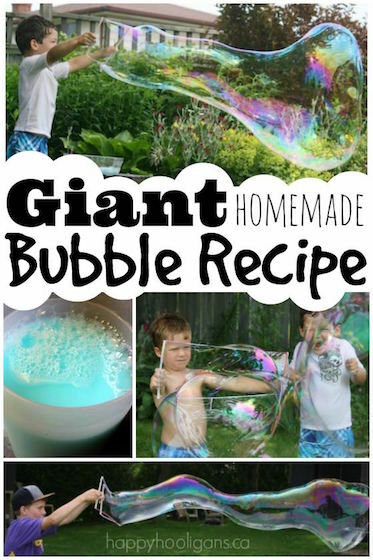 In a pinch, a sturdy kitchen roll, makes an excellent bubble wand. Make a set of simple “stand up” paper dolls. Well? What do you think? Did we inspire you? Now, it’s your turn to inspire me! 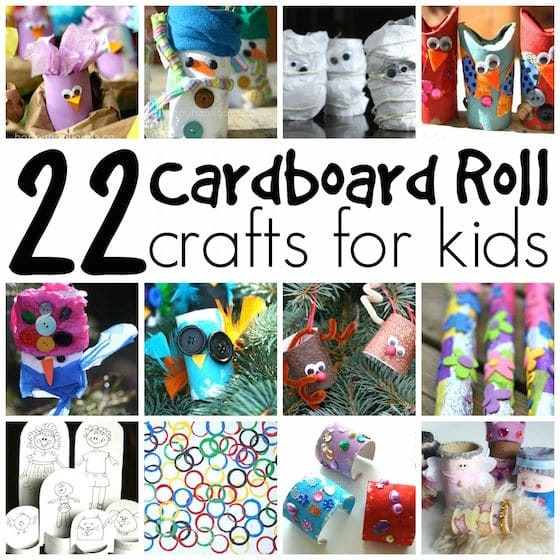 If you have a favourite cardboard roll craft or activity, I’d love to hear about it! Before you go, be sure to check out this fab collection of tp roll Christmas crafts for kids by Red Ted Art. 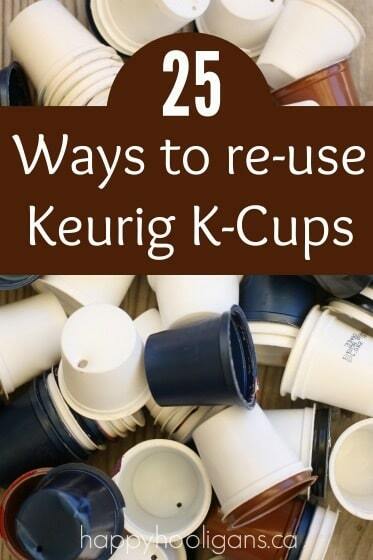 25 Ways to Re-use Your K-cup pods. You have so many great ideas! And I don’t feel like I am going to end up on Pinterest gone wrong. Those are very useful, I will definitely be trying them out, thank you! I was wondering if you had any ideas for chopsticks or plastic cutlery? I have tons of those and I would like to put them to good use. We use plastic cutlery for playdough play. Great way to teach children early cutting skills. Chopsticks stuck into playdough and then drop large beads or rings onto them is great for fine motor skill building. I LOVE how you have ideas for every season! I also use them for the cords on appliances like electric pan will hold cord together to put inside pan,and the appear towel rolls cut length wise and put on hanger so you don’t get mark on those dress pant in closet. Oh, that’s brilliant, Darlene! Maybe I’ll have to do a post up about house-hold hacks with cardboard rolls! Thanks for sharing the great ideas! What a great list. I love that 3-D sculpture art and the stand up puppets. We love making ours into characters like these superheroes. Ignore the old blog link on the actual photo! Old photo but new blog! I hot glued a few rows of them together for my dresser drawer and stick my undies inside them to keep them in the same place instead of having to sort through a bunch to find the pair I’m looking for. Oh, that is just BRILLIANT, Amanda! I love your ideas. I had a few myself & I must say that I have a whole box full & still saving……They are also good for planting seeds early spring, to get ready to plant later. Great Ideas! I gave you a wrong email address….. This one is correct! I use paper towel rolls for greeting cards holder! Feed yarn through paper towel roll until you cover the roll. Take a greeting card loop it through under the yarn. It will look like a fan when done! Another use: Decorate toilet paper tube and use it to store wound up extension cords. Love the idea of decorating them! I am using those cardboard tubes & making candle decorations. I’m crocheting a tube to fit over the cardboard tube, then using those little plastic bathroom size cups, I put the bottom of the cup in the tube about an inch or so, then cut off the top of the cup. Glue the bottom of the cup in to the tube Place a battery operated tea light in the cup. I don’t have a picture of one right now, but I will get one soon & post it. Take the tubes and cut long wise making ‘gutters’. Fashion the gutters on a water bottle tray cardboard box in the shape of a Jesus fish or peace symbol as examples. Dip colored tissue in a water/glue mixture and line the gutters with color. Roll a marble in the gutters after it’s dry. A REALLY FUN game! >>>Have made playful bracelets made by myGrand-daughter & use them randomly for craft-projects. >>>I keep ’em around for “Used-sanitary-PAD disposal” like in the old days when they had individual pkg’d cardboard/strong maxi-pads where you can dispose the old one using the same box. I find this better than wasting toilet-paper which leaks through at times and this also keeps the odors minimized &view out-of-site! ***I smash them flat and rubber-band them together since i can’t seem to use them fast enough so Thank you for sharing other ideas and just knowing i’m NOT the few who does this is great to share with my other half who thinks i’m crazy for saving them! But then again, he doesn’t practice sustainable living much either, hee hee.. I use long cardboard tubes in the sensory table. My preschoolers love to fill them and watch the rice or wood pellets travel through them to a bucket down below. Shorter tibes are good, too to fill buckets. I cover the tubes with colorful duck tape to make them sturdier and fun to look at! Some great ideas, both in post and comments! And so glad to see I’m not the only one who collects them! I use them for organising, and also make crackers at Xmas with them. Would be interested in seeing a post with ideas for adults uses – not really up for bracelets!! You can split tubes lengthwise and put them around your tubes of gift wrap. It will keep it neat. I prefer to use two rolls, one near each end. 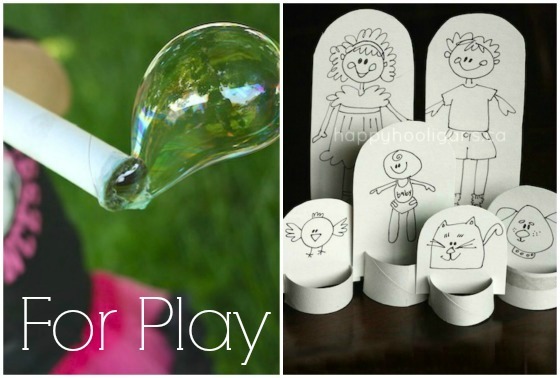 You can cut them into 1/2″ circles for creative play. They can be glued together with hot glue to make trees, too….Christmas trees, bare branches, leaves, your choice. They can be painted in various colors. Think about things made with cheereos in the commercials. You can make a family tree and put pictures in each ring, to hang on the branches. The tree can be painted on a board ot made with twisted wires. Extra electrical wiring can be cut to desired lengths, ‘skinned’ and twisted together to make tree trunks and branches. I can’t help myself from saving tp tubes either…so doesn’t the Scott Toss the Tube commercial just freak you out a little? Haha! Yep. Kind of! Even more reason to hoard them, Barbara! I am a typical crafter, and save most things once I have thought what I can do with them! My late husband bought me a large storage container for a present one birtday, and he gave it its own name – “Justin”. You can work that out – (just in case)! I put everything in there, and when I want something different to do, Justin comes out to play! I open it up, dive in and start making things. I do paper sculpturing, and I make greeting cards, and “off-the-page” photo layouts and pictures (the cards are my main activity). I have often used the tubes as a base for sculptures, like an armature. Squash a roll flat, cover it with fabric, adding a flap, with a velcro dot seal, and you have a case for your specs or sunglasses. Join two together if you wear different glasses. Cut a toilet roll tube in half, flatten them and stick them together. Cover with double thickness fabric, with a velcro fastening flap (insert a piece of card for stiffening before sewing it up), and you have a small coin purse, or credit and business card holder. I have done the wall decorations. I have also made “tube-dolls”. Part of a tube can be used in the neck of hand puppets to keep the head fom flopping about. Last of all (here,at least) I’m sure everyone has used them as desk tidies. I cut them to lots of different lengths, stick them together, make lids for some, decorate them, and they can make my work area tidy and attractive. 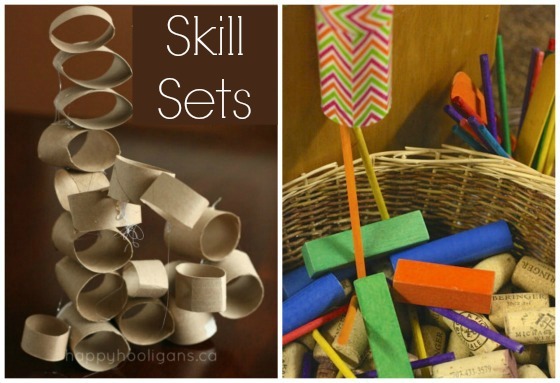 So many great ideas and endless activities with the kids using readily-at-hand materials. Thank you! I have over 100 cardboard tubes that we have done nothing with. Yay! Sounds like you are awesome grandparents! Your family is so blessed to have you! 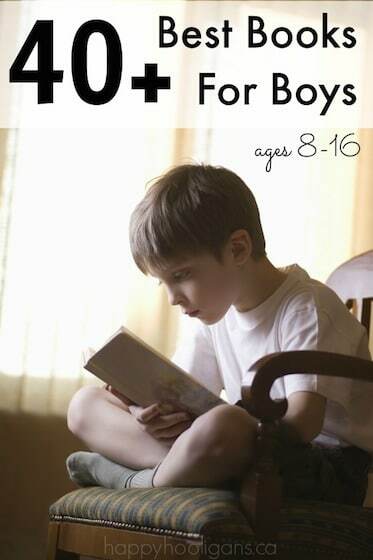 I love all the great ideas listed here. One that I use is to roll a drawing or pattern and slip it into a cardboard tube. Keeps it neat without creases. Of course my great-grandsons think they are mega-phones or telescopes. Kids can always make a game out of anything. Your pattern idea is brilliant, Verda! I’ll definitely use that tip in my sewing room! I cut toilet rolls in half….covered with fabric that has breast cancer symbols..filled with indivually wrapped peppermints and enclose inclear cellophane and tied at both ends with pink ribbon. Given as a gift during October…breast cancer month! cut them in thirds and use to plant seeds. Place in plastic tray or pot to catch water.